How to Set Priorities Effectively and Smoothly! - Atlas Consulting - One Stop Tax and Business Solutions! How to Set Priorities Effectively and Smoothly! As I said in my previous post, time is money and it really counts how we start our day. Knowing how to set priorities is really important if we want to be effective and successful. I highly recommend you to read this book thoroughly, especially the ones that need guidance and help in goal setting and goal accomplishment. 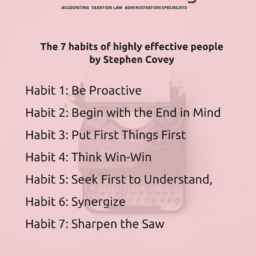 In his book, Covey identifies two types of tasks – reactive and proactive. It’s how we set priorities that makes us be proactive or reactive in our way to accomplish our goals. If we want to run our business or organization smoothly, we need a mix of proactive and reactive tasks in our daily list of things to do. There are tasks that are routine tasks and need to be done everyday no matter what. These are the reactive tasks. They’re essential for the smooth and efficient running of your business. They don’t bring long-term results, but they get the routine work done. Reactive tasks come from outside of you. They are those that other people want we to do, or that your business requires us to do. Do you want to accomplish a big goal? Do you have a big business vision? Proactive tasks have to do with our big picture ; thus our supreme goal or our vision. These are things that don’t bring immediate results but rather long-term benefits and we plan them and act towards them regardless of outside circumstances or pressures. Proactive tasks come from inside. They are those that we want to do. 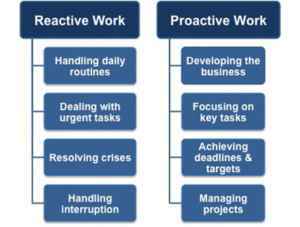 The truth is that we need both, reactive and proactive tasks. And the reason is quite simple: we need both of them in order to have a balanced business life. We need the long-term benefits that proactive tasks bring as well as the reactive tasks’ for our daily routine in running of our operations. Proactive tasks can be easily procrastinated. We tend to forget or delay our proactive tasks when we are busy. That is quite tricky if we want to stay motivated in the long run. They also require more critical thinking, which may make them challenging. Reactive tasks are more “operating”. If we delay or we do not complete our reactive tasks, there may be negative consequenses. Thats does not happen if we delay our proactive tasks. As we said before, all the tasks are useful both for the operation of our business and for its sustainability. In our routine, it may be difficult to prioritize especially when we have to think about the viability of our business every day. We usually choose to undertake tasks that are urgent or those that we need to do in order not to face negative consequences. And we usually tend to forget our proactive tasks because they are not so urgent and we feel them like a luxury in our everyday life. As we can see, it’s important to identify which tasks are proactive and which are reactive, and to make sure the proactive tasks are in our daily to-do lists and are not forgotten. No matter how urgent certain tasks are, we have to make sure that we devote some time each day to things that bring us long-term results, a sense of accomplishment and purpose. Don’t forget that what keeps us motivated and resonated is to believe in something bigger and try our best for it. What I mentioned in my two latest post we can be more productive and effective if we learn how to take care of day to day busines life. How we start our work day and how we set priorities is quite crucial. Is there anything I can do to make my working dayt smoother and more productive? Are there any tasks that are not met and accomplished today and why? Do not forget that time is money and it is all about the way we do things..
Be sincere and stick to what is more proper for you. Keep calm and priotize for best ROTI .